Hmmph. If you read my earlier post about carbon footprints, you can pretty guess my thoughts on Winter Bike to Work Week. The reality is there is never going to be a Bike to Work Day that I am physically capable of unless I work at home. It’s possible I might survive a ride down to Boulder to Nederland. 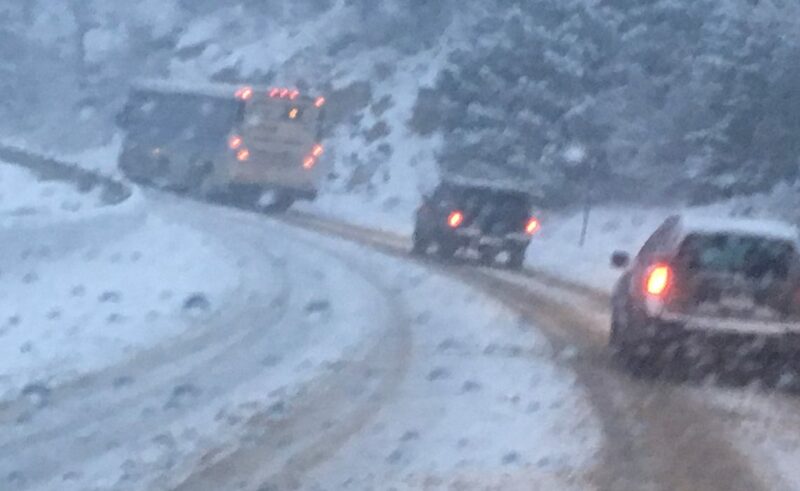 Although every time a bus would whizz by in Boulder Canyon, my heart would skip a beat. But there is no way I would ever be able to bike 12 miles and 3,000 feet back up hill to my home. Nor would I want to. Of course, I knew plenty of die hard folks who took this Winter Bike to Work Week seriously, and donned their warm jackets and gloves and bravely pedaled along. Truth be known, it wasn’t too bad Monday and Tuesday, but today, it was a different matter. Still, in an effort to at least show some sort of commitment to reducing climate change, I vowed to take the bus Monday and Wednesday. (I had a doctor’s appointment on Tuesday). I still planned on that right up until I read the weather forecast last night. The one that talked about highs in the teens, with snow starting around noon. That one. There are many people who think that kind of forecast is exactly the day you want to take the bus. Who wants to deal with having to brush all that snow off your car, and having a white knuckle drive up Boulder Canyon? But those of us who have been around awhile, know that is exactly the kind of day you do not want to take the bus. The first year we lived here, I had a rather hair raising drive up Boulder Canyon on snow packed roads. As the road steepened in The Narrows, I spotted the RTD bus struggling to keep the wheels turning. Then suddenly the bus starting slideways across the road. Valiantly, the driver kept trying to get the bus moving, the tires would rotate, but the bus did not move. It was stuck. Thank God I am not on that bus. But then it hit me. How was I going to get around that bus. The massive vehicle blocked both lanes. To make matters worse, it had become mired in the slushy snow right on a blind curve. Other cars were in line behind me. I said a little prayer, and pressed down on the accelerator, praying no one was coming the other way. I dreaded seeing headlights and getting smacked. Thankfully, I made it. But the image of the stuck bus, and the story I heard from a neighbor made me swear off the bus during a snowstorm. This morning, as I passed the bus stop, I saw all those naive people waiting for the bus. And tonight, as the bus yet again struggled up The Narrows, I thanked God for to be driving a Subaru with snow tires.